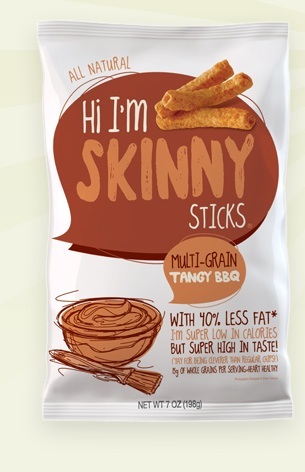 Hi I'm Skinny Snacks is a line of salty snacks that are better for you than chips and other snacks. They have a fairly large serving size which is the first thing that attracted me to them. I hate when you get to have like 11 chips for a serving. With these snacks, you get 34 straws for one serving which is 130 calories. The first kind that I tried was the Multi Grain Tangy BBQ. I brought these to a movie night with my husband and parents and they all liked them. They are perfectly crunchy and flavorful. I felt a lot less guilt eating these than I would have with a bunch of chips. You still get that salty flavor without all of the added fat and calories. These snacks are skinny on fat, these crunchy characters come in snappy new flavors like Multi-Grain Cheddar, Multi-Grain Tangy BBQ, Multi-Grain Sweet Onion, Multi-Grain Sea Salt, Veggie Tortilla and Sweet Potato. Developed in house by Cornfields, Inc., the better-for-you snack company, Hi I’m Skinny Sticks® are all natural, GMO free, and pack up to 17 grams of heart-healthy whole grains per serving. In addition, the new snacks contain up to 40% less fat than regular potato chips. The sweet onion snacks were also very tasty. These would be perfect dipped into a low-fat dip. For a healthier snack, try HI I'm Skinny Snacks. Those sound SO good right now! :) And anything that's GMO-free is great in my book!